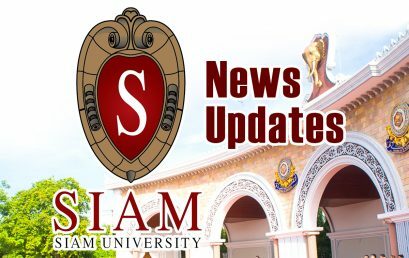 On 17 September 2016, Siam University students join with the new incoming students to celebrate Siam University Freshy Day. Students, faculty members and administrators joined this great celebration. The event portrayed a grand festive occasion with cheerleaders, dance performance and best Siam Dress code contest. 8 September 2016, Siam University president Dr. Pornchai Mongkhonvanit and fellow professionals from Siam University provided awarding scholarship and prizes as part of Wai Kru 2016, and welcoming class of 2020. The officials start new academic year 2016 following through the Thai ritual Wai Kru. Dr. Pornchai Mongkhonvanit, President of Siam University has attended ASAIHL Academic Conference on Open Access and Borderless Education at Silpakorn University,Nakorn Prathom on 4th September 2016. Siam University again arranges blood donation campaign on 25th August 2016. Students, faculty members and staffs of Siam University are actively participating on the charitable occasion, which predominately shows the powerful community contribution towards sustainable development. Siam University president Dr. Pornchai Mongkhonvanit effectively taking initiatives for community development together with Siam University faculties and Thailand Traffic Police.